Funds raised through Kickstarter didn’t go to waste this time. An extremely well-experienced team has created a classic RPG that provides a natural continuation of ideas introduced in Baldur's Gate and Planescape: Torment. Combat tends to be chaotic and unclear. When RPG veterans engage in creating an old-school game of this genre, you just know that something's up. In fact, a lot has happened with Pillars of Eternity – the impressive amount of USD 4,000,000 raised on Kickstarter in autumn 2012 speaks for itself. The level of people's interest in the return to the classical patterns taken straight from the turn of the centuries has exceeded the wildest expectations. However, we had to wait almost two and a half years until the final version of the product saw the light of day. 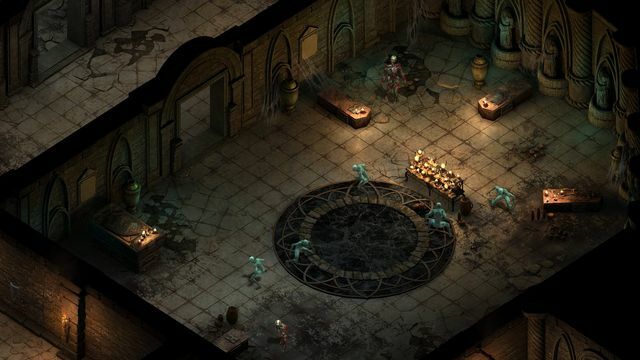 At first glance, it may seem that we are dealing with a direct continuation of the ideas introduced in Baldur's Gate II. The creators have made clear references to its interface, mechanics and even the soundtrack. How do you find, however, the fact that in the world of Pillars of Eternity travel of souls is not a matter of faith, but an irrefutable, scientific fact? Here's a realm, located on the outskirts of a huge fantasy world. Marked with turbulent history and barely healed wounds, this region fell victim to decimation caused by war and religious cleansing. As much as it is dangerous, it is also full of opportunities for adventurers brave enough to seize them. A continuous string of colonists heads to the Dyrwood to make use of a generous offer made by a local lord. A few acres of land sounds like a good idea for a fresh start; sadly, the short period of prosperity is coming to an end and our hero is destined to play a key role in the events that can change the fate not only of this area, but of the entire world as well. 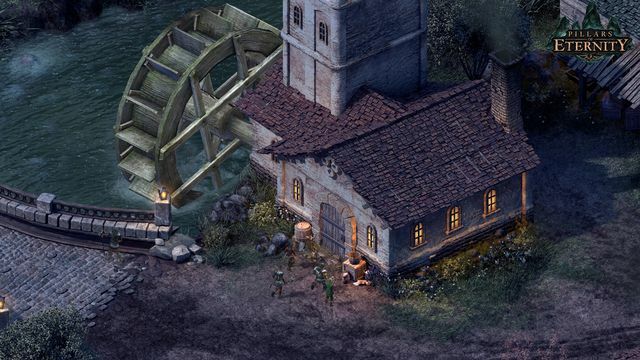 This sound like a rather cliché beginning of a story, but don't worry – Pillars of Eternity manages to spread its wings in less than 30 minutes… and then it just keeps on getting better. The game is a successful mixture of several trends. We visit dingy villages and traverse sparsely populated areas like we did in Baldur's Gate. We also engage in epic storylines of almost cosmic proportions, same as in Baldur's Gate II: Throne of Baal. 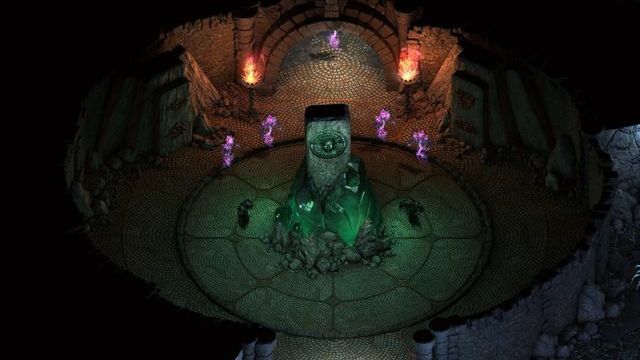 A feature it shares with Planescape Torment is a great ambition to imbue a story about saving the world with philosophical and religious themes. This all adds up to create a unique atmosphere which is more reminiscent of the gray and gloomy Old World than the idyllic Forgotten Realms. Suffice it to say that at the end of the game I couldn’t find it in me to unequivocally condemn the motivations driving Thaos, our nemesis. Much of the credit goes to the great script which translates not only to the quality of dialogue and descriptions (and these are top-notch), but also the variety of side quests, the pace of the game, and its overall atmosphere. 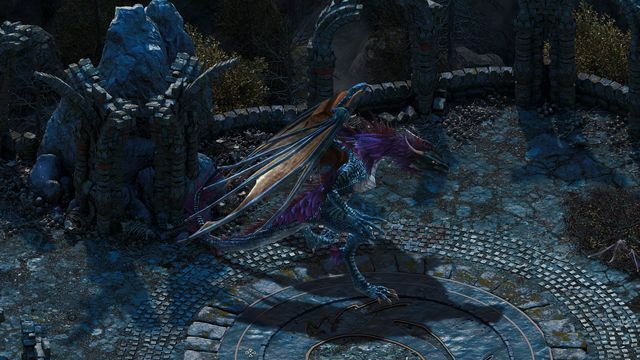 Pillars of Eternity is a very "precise" game as opposed to modern productions such as Dragon Age: Inquisition. It seems that Obsidian stripped the final version of almost everything that would not be justified plot-wise. We are never tasked with looking for some insignificant items, and we don't waste time killing the same groups of enemies time and time again or exploring vast, empty expanses of land. I don't recall there being a quest in Pillars that would act as a simple filler. Even minuscule actions and random dialogues seem to be of consequence. A good example is the scene of our encounter with an urchin who set his sights on an ornate dagger in the market square. A simple dialogue leads to a short task which prompts us to make a number of decisions. What’s the best way to recover the weapon from a customer who has beaten us to it? What should we do with the dagger once we get it? What should we say to the boy? Imagine my surprise when a few hours later I met his father who was simply dumbfounded when he learned that a bunch of travelling scoundrels fulfilled a whim of a teenager without a second thought. The game made me feel like a complete idiot. Arming children as a means to saving the world – what a wonderful idea! And it was only one short scene in a sea of tasks and long conversations, which had actual impact on my reputation. 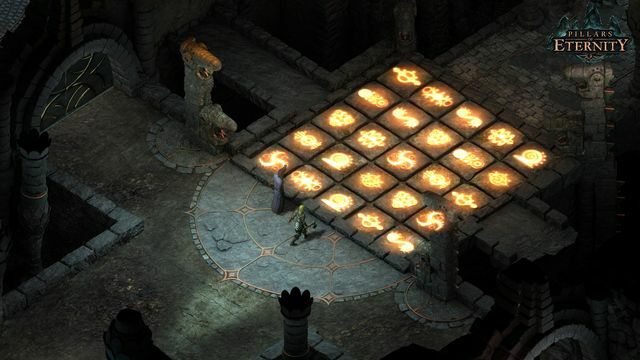 Initially, we create only one character in Pillars – same as we did in Baldur's Gate. Other companions join us along the way, but thanks to the option of hiring mercenaries for a fee, we can also fill our team with other characters with specific parameters. For instance, we can add a second or third wizard to our band if we feel like it. Along with gaining reputation – by means of completing tasks, but mostly by participating in conversations and making decisions – we receive new dialogue options. We have to keep in mind, however, that the player is headed towards their goal on a relatively clearly marked path. Some decisions can ultimately contribute to a slightly different ending assembled from "modules", like it was done in Fallout 2, but individual side quests and the things we say have limited consequences for the whole story. Being rather temperamental myself, I managed to intimidate opponents more often than not. In one amazing scene this led to an escape of two enemy mercenaries, leaving the rest of the gang in an uncomfortable situation. On a different occasion, I silenced a serving maid who tried to force me out of a closed part of a noble's villa with a slap on the face. Apart from such decisions, the course of events is influenced by other aspects, such as our attributes, skills, and to a lesser extent, character class, race and origin. I deeply regretted not having invested more points in intellect during the creation of my character, as I had the impression that many alternative task solutions were unavailable to me for this reason. 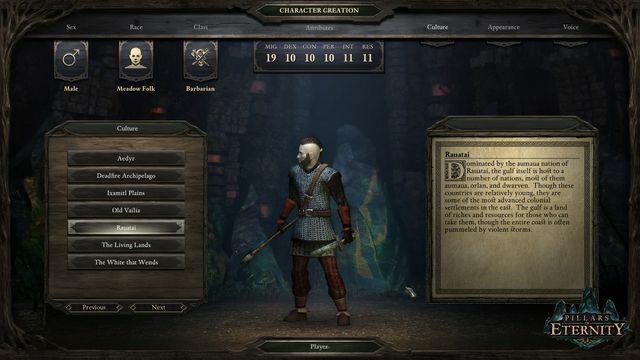 Pillars of Eternity encourages us to put some effort in modifying the attributes, as the decisions taken on the character creation screen echo throughout the entire game. Conversely, less fiddling is required with character development; some parameters increase automatically level by level, but we can choose ourselves special characteristics and assets that allow us to specialize in the use of a particular weapon or increase resistance to a certain type of injury. Some classes (Warrior) are extremely easy to develop, while others (Cipher, for instance) require a careful selection of talents and skills to forge them into effective killing machines. Lest we forget that Pillars of Eternity is also about combat. Although we repeatedly manage to avoid danger by arguing our case to the opponents, we will also spend a lot of time pausing the game with the spacebar and giving orders to members of our team. In this respect, we are dealing with only a slightly modified system taken straight from 1999. It usually works very well – with more demanding skirmishes it enables a fairly precise control of team operations, and with easier ones we can simply watch in real-time as the vanguard crushes weaker monsters. Problems arise when we participate in massive clashes within a closed space. As clear as our command may appear ("Cast a healing spell! "), we can never be absolutely sure how our character is going to react. We may find that they are blocked by a wolf companion, or – in order to be in range – will choose the shortest path that leads through a horde of overgrown beetles. During fights that involve the full attention of our entire, six-member ensemble pitted against a dozen monsters, sometimes it's really more convenient to rely on luck and throw a fireball in the middle of the whirlpool. Such suicidal tactics make sense in Pillars, because – in contrast to Baldur's Gate, for example – punishment for "death" is virtually nonexistent. The creators decided to introduce the mechanics of... health regeneration. There are two parameters determining a hero’s points of life – once they lose the classic HPs, the character (who is now only unconscious) falls to the ground. Provided that at the end of the battle there is at least one person standing in our team, the whole operation is a success. After the fight, the HP pool is replenished using the endurance reserve, and it is only when this second coefficient wears out that severe or even fatal injuries occur. I admit that these mechanics are convenient and allow for smooth gameplay. We don't have to load a previous save only because some bandit managed to pull two critical hits in a row and thanks to pure luck beat our warrior to a pulp. Management of team’s endurance boils down to choosing when to make camp... and this is where a certain difficulty appears. On each of our travels we take strictly limited supplies; if we use them carelessly, sooner or later we will be forced to march to the city to replenish them. 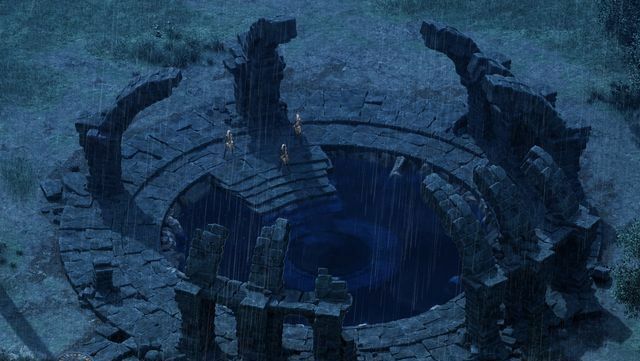 Pillars of Eternity "rewards" us with negative consequences if we choose to rest underground. Taking a nap in taverns translates to big bonuses to our parameters. That’s a pretty good idea! These mechanics do not mean, however, that the game is easy. Even when playing on normal difficulty level, we will sometimes have to go back to the city with our tails between our legs or avoid confrontations with more powerful opponents, at least until we strengthen our team. On the higher level, things get more exciting – we encounter stronger creatures sooner, and even the composition of monsters underground and in the wilderness changes. I strongly recommend that the veterans of the genre switch to this level of difficulty right away. It’s a good idea to enchant items; with the right ingredients and level of experience, we can create effects that we’ll find useful, such as increased armor resistance to poison, if we find the encountered spiders a nuisance. Of course, enchanting serves as a complementary function. In the world of the game we will find powerful artifacts whose parameters are way better then the statistics of home-made stuff; what’s more, each object can only be improved several times. Apart from the enchanting option, the creators have also implemented a simple crafting mechanism. We can use it to cook up food that increases statistics for a specified time, brew magical drinks and draw up scrolls with spells. I admit that I only tried it out several times -– the importance of crafting doesn’t increase until reaching higher levels of difficulty. With the number of available recipes being very limited, we’re not really allowed to let our imagination run wild or create unique items. It was with equally mixed feelings that I took on the management of my own stronghold. Erecting new building and hiring mercenaries is fun at first, but unfortunately does not offer as many opportunities as you might expect. Additional random events can be distracting, and ridding the game of this element would not lessen the experience. Characters found in our headquarters are hardly worthy conversationalists – their role is purely utilitarian, as they make it possible to buy supplies and sell unnecessary junk in one place. The greatest asset of the stronghold is its vast underground, which stretches across 15 levels and is full of puzzles and some of the most challenging fights in the game. Each floor has been meticulously designed, and the secrets and loot found there successfully encourage us to delve deeper. As it happens, this is the largest side quest... and with some alterations it could easily become a stand-alone game. The underworld of Caed Nua makes for a dungeon crawler is in its purest form and is a great escape from the complex main story arc. At the same time, Pillars of Eternity never allows us to lose sight of our most important goal. This production is clearly subordinate to its plot – you can notice this in the long descriptions, detailed scenes that look like taken straight out of a gamebook and the relatively small world of the game, which eliminates endless wandering and avoiding the main storyline at all costs, Skyrim-style. At times it is difficult to distinguish which tasks compose the axis of the story – it is a testament to the effort made by the designers who have devoted as much energy to side quests as they did to the captivating pursuit of the main villain. No sooner than after completing the game did I fully appreciate the consistency of the world and the scenario presented. Compared to Pillars of Eternity, the nonsensical story of Divinity: Original Sin looks really ridiculous, whereas Corypheus of Dragon Age: Inquisition fame compared with Thaos from Pillars seems quite dull. All things considered, Corypheus is just another generic abomination whose guts you must spill. In Pillars, the threat is present in the form of an idea used by an insanely intelligent manipulator (or visionary?). When Corypheus appears on the screen, the most you can do is snort with laughter when looking at his twiglike paws. Conversely, Thaos seeps his poison with a truly devilish effectiveness, and the very concept of where the archenemy draws his experience from is truly brilliant. Pillars of Eternity took a bold approach to the concept of gaining experience from killing monsters. We only get points for killing creatures unknown to us; once we complete an entry in the encyclopedia, which usually requires disposing of six creatures, the spring of XP is exhausted. Initially, the solution was not to my liking, but over time I noticed its beneficial effect – it made me focus on the tasks, look for new challenges, and avoid fights whenever I could. Near the end of the game, the pursuit of Thaos made me feel truly enraptured with the plot; there was no dragging on or avoiding the final – I just had to find out what happened next. Subsequently, as soon as the end credits started rolling, I launched a new campaign. This time, I am determined not to miss any dialogue or secondary locations. 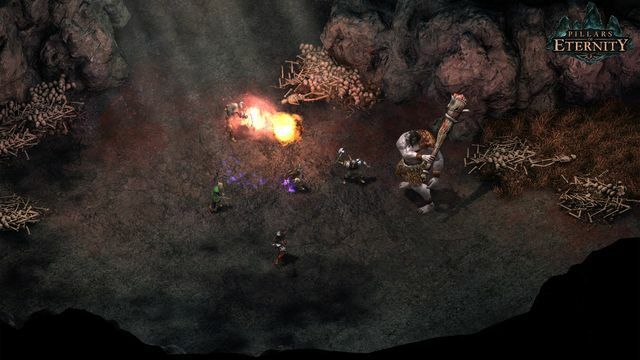 It is very clear throughout the entire game that Obsidian’s ultimate goal was to create a game targeted at a very specific audience – people like me, who remember with nostalgia the era of Baldur's Gate and Planescape: Torment, and expect an RPG to provide a great amount of text to digest, tactical combat, deep mechanics, and a stylish design combining elements of 2D and 3D graphics. 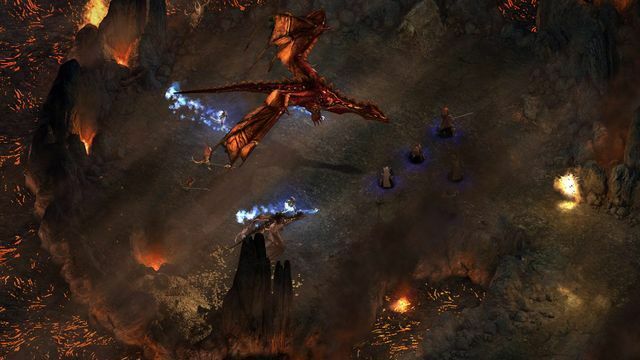 Luckily, the designers chose not to approach the achievements from 15 years ago with too much awe; Pillars of Eternity is more than just a tribute to the games by Black Isle – it is also a legitimate development and update of the old ideas. Using a well-known pattern, Obsidian succeeded in creating something new, unique and in many ways superior to its legendary predecessors.